Kotb, N., Ibrahim, H., Ahmed, A. (2018). An Environmental Integrated Management System for Electronic Waste inside Enterprises. International Journal of Sustainable Development and Science, 1(2), 1-19. Noha Moustafa Kotb; Hesham Zaki Ibrahim; Amel Ibrahim Ahmed. "An Environmental Integrated Management System for Electronic Waste inside Enterprises". International Journal of Sustainable Development and Science, 1, 2, 2018, 1-19. Kotb, N., Ibrahim, H., Ahmed, A. (2018). 'An Environmental Integrated Management System for Electronic Waste inside Enterprises', International Journal of Sustainable Development and Science, 1(2), pp. 1-19. Kotb, N., Ibrahim, H., Ahmed, A. An Environmental Integrated Management System for Electronic Waste inside Enterprises. 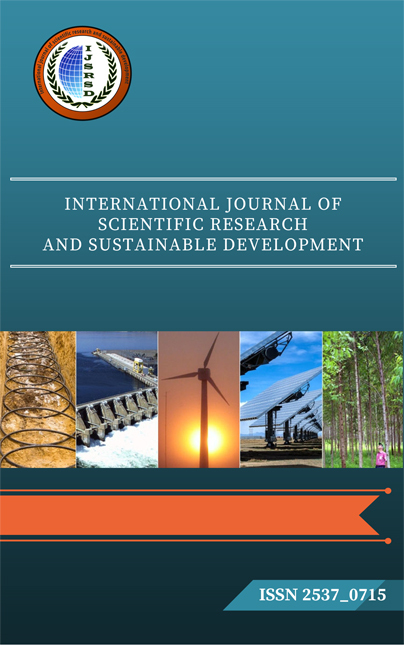 International Journal of Sustainable Development and Science, 2018; 1(2): 1-19. Increasing of the electronic waste all over the world is related to the rapid growing of information and communication technology. Electronic waste contains highly toxic substances and improper handling for this kind of waste will cause several impacts on human health and environment. Management of electronic waste is still in its initial phase in different developing countries. Aim of the study: Absence of specific guideline and strategy about managing of electronic waste inside different enterprises leads to develop an evidence-based integrated environmental system for management of electronic waste by using an Evidence Based Practice (EBP) methodology. This integrated system covers all aspects related to the management of electronic waste This system can be used as a guideline by the officials and responsible staff in different enterprises for managing of electronic waste in proper manner to safeguard the human health and environment from the negative impacts that generated from electronic waste. نظرا لما یشهده العالم من تطور فی مجال تکنولوجیا الاتصالات و المعلومات فقد أدى ذلک إلی ظهور ما یعرف بالمخلفات الإلکترونیة و تعد هذه المخلفات ططرة نظرا لما حتتوی فی ترکیبها من مواد ططرة و التى تسبب أضرار بالغة للأنسان و البیئة. تمثل الإدارة الغیر سلیمة لمثل هذا النوع من من هذا المنطلق فإن وضع نظام إدارة متکامل للمخلفات الالکترونیة أصبح ضرورة الأن ضمانا للحفاظ على البیئة ، المخلفات تهدیدا للصحة و البیئة و صحة الانسان. Kaya I. (2012). Evaluation of outsourcing alternatives under fuzzy environment for waste management. Journal of Resources, Conservation and Recycling. 60:107–118. Nnorom I. C., Osibanjo O. (2008). Electronic waste (e-waste): Material flows and management practices in Nigeria. Journal of Waste Management. 28: 1472–1479. Edlund W, Gronseth G, So Y, Franklin G. (2004). Clinical practice guideline process manual. Scottish Intercollegiate Guideline Network (SIGN) System. (2008). http://www.sign.ac.uk. Glasziou P., Del M. C., Salisbury J. (2007). Evidence-based practice workbook: bridging the gap between health care research and practice. 2nd ed. Oxford, UK: Blackwell Publishing Ltd. Guidelines of Integrated management system for medical waste prepared by Egyptian Environmental Affairs Agency and ministry of Egyptian Health (2009). Egyptian Environmental low 4 for 1994 amended by 9 for 2009 and executive regulation. Viegas C. V. , Bond A., Ribeiro J. L. D., Selig P. M. (2013). A review of environmental monitoring and auditing in the context of risk: unveiling the extent of a confused relationship. Journal of Cleaner Production. 47:165-173. Environmental management systems —Requirements with guidance for use, ISO 14001. (2004) Second edition, 11-15. Gottberg A., Morris J., Pollard S., Mark-Herbert C., Cook M. (2006). Producer responsibility, waste minimisation and the WEEE Directive: Case studies in eco-design from the European lighting sector. Journal of Science of the Total Environment. 359: 38– 56. Truttmann N., Rechberger H. (2006). Contribution to resource conservation by reuse of electrical and electronic household appliances. Journal of Resources, Conservation and Recycling. 48: 249–262. Dindarian A., Gibson A.A.P., Quariguasi-Frota-Neto J. (2012). Electronic product returns and potential reuse opportunities: a microwave case study in the United Kingdom. Journal of Cleaner Production. 32: 22-31. Tsakona M., Anagnostopoulou E., Gidarakos E. (2007). Hospital waste management and toxicity evaluation: A case study. Journal of Waste Management. 27: 912–920.